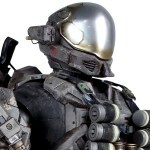 3A has released new images and info for two upcoming Halo: Reach figures. The new images give us our best look at their Emile figure as well as a new look at their EVA figure. EVA is a Bambaland exclusive. Pre-orders go live on Friday. Each figure will sell for $220. Read on for all of the images and more info.